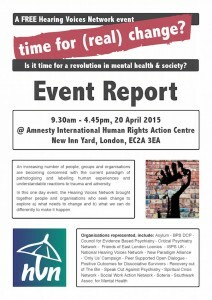 Many of you will be aware that, HVN hosted a free event in April with that aim of bringing together a wide range of people and organisations concerned with the current paradigm of pathologising and labelling human experiences and understandable reactions to trauma and adversity. To host a follow up event to take the next steps towards collaboration between those of us who believe it really is time for real change. We rare excited to share our event report with you. Please feel free to download and distribute the report with anyone you think may be interested. Whilst HVN does not see itself the lead of this initiative, we agreed with attendees of the event that we would host the first working group to ensure that we build some momentum. 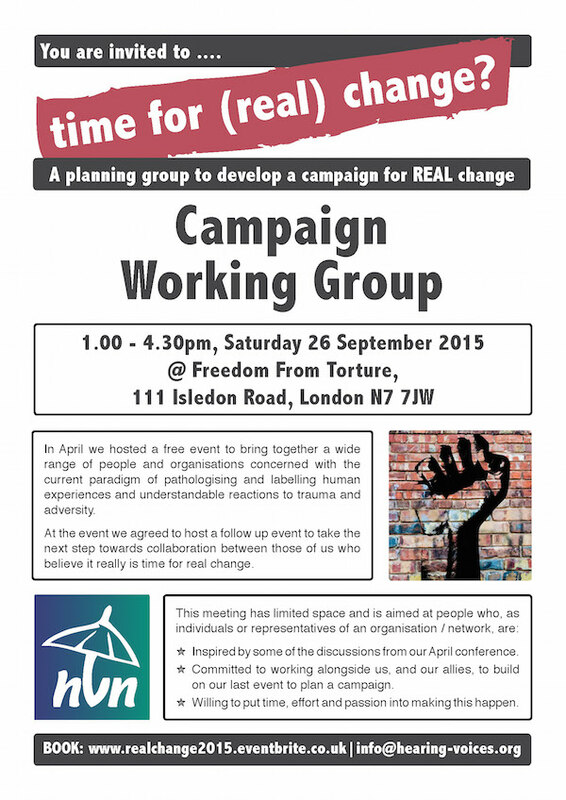 As such, the first campaign working group will take place on Saturday 26 September from 1.00 – 4.30pm at Freedom From Torture (111 Isledon Road, London, N7 7JW). Inspired by some of the discussions from our April conference.